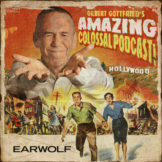 Gilbert and Frank welcome an old friend, legendary comedy writer Bruce Vilanch, who looks back at the “golden age” of TV variety shows and specials, including “Donny & Marie,” “The Brady Bunch Hour,” “The Star Wars Holiday Special” and “The Paul Lynde Halloween Special.” (all co-written by Brucehimself). Also, Margaret Hamilton makes her move, Robert Reed channels Carmen Miranda, Jack Benny does “The Match Bit” and Gilbert takes over “Hollywood Squares.” PLUS: Jack Palance! Bob Hope’s filing cabinet! “Wayne Newton at SeaWorld”! Bruce hangs with Tallulah Bankhead! And the Oscar joke that never made the air!